Investigators from the InformNapalm international volunteer community continue to publish evidence and data on Russian war criminals – veterans of “Ukrainian assignment”, executing criminal orders of Russian military-political leadership in the eastern part of Ukraine. New information is based on the OSINT-investigation demonstrating and providing additional facts of the participation of reconnaissance detachment of the 18th Motorized Rifle Brigade (military unit No. 27777, 58th Army, Southern Military District, Republic of Chechnya, Khankala and Kalinovskaya villages) in the Donbas war. The mentioned military unit, which was one of the first taking part in the undeclared invasion of the eastern part of Ukraine by Russian armed forces, has been described at least in seven investigations done by our volunteer community. As per to the studies and analysis of the social networks of Russian servicemen of the Motorized Rifle Brigade, there is a group of three contract-based servicemen detected who went through “Rostov-Ukrainian assignment” in summer and autumn of 2014. It was possible to obtain not only visual photo facts confirming arrival and participation of the Russian scouts in Donbas active combat zone, but also the copies of the State awards certificates. 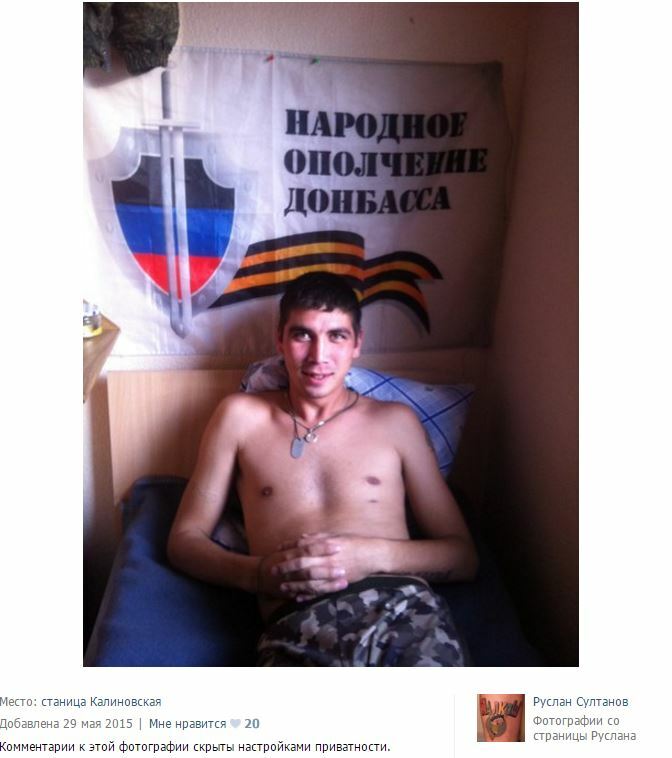 Common indicators pointing out photo materials of Russian scouts are in relation to summer-autumn events in the eastern Ukraine are the identification armbands, non-commissioned uniform, comments etc. And that made it possible to link them with the previously identified tactical group from the 18th brigade. Vitaly Alikhanovich Shkirin, born on April 19, 1990 in Tyumen. Social profiles – “VK” (archives of profile, album, contacts), “OK“. He was awarded “Medal of Suvorov” No. 41099 (by Russian President Putin’s decree from October 24, 2014). 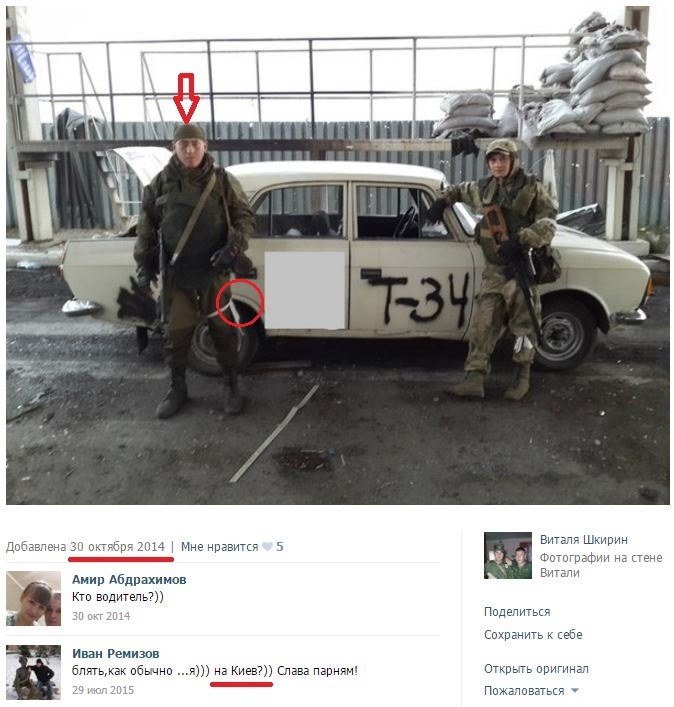 A little bit earlier, he posed against the background of a “Moskvich T-34” car with a white identification armband of Russian-“Novorosiisk” forces and his comrade (will be discussed further) Ivan Remizov’s comment “..on Kiev”. Ivan Remizov, born on 1975 in Volgograd. Social profiles -“VK” (archives of profile, album, contacts), “OK”. 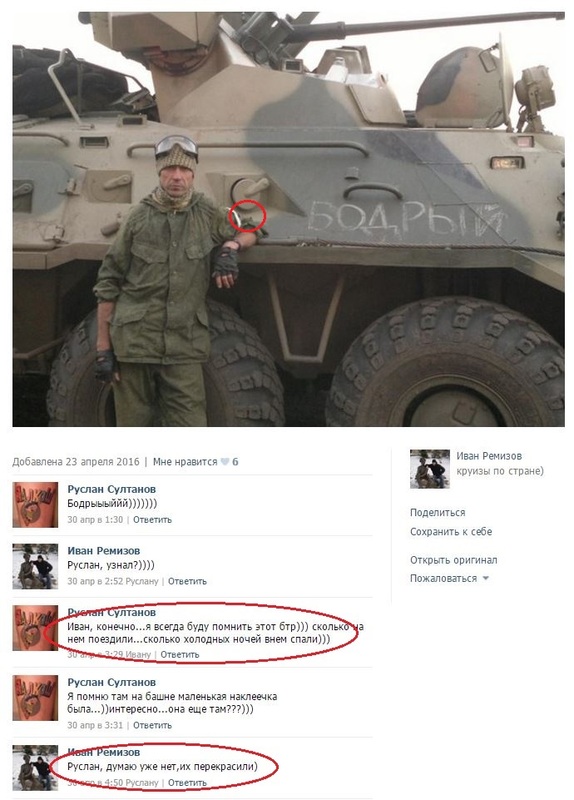 In April of 2016 he uploaded some photos nostalgic for the “Ukrainian assignment” including a photo in front of “BTR-82” named “Bodry”. He is in a non-commissioned uniform with a white identification armband followed by curious comments made by him as well as his former colleague and comrade Ruslan Sultanov (will be discussed further). 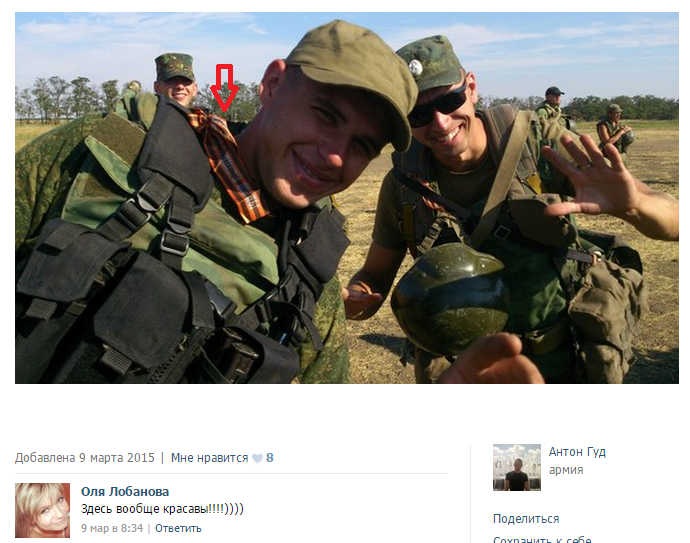 We remind you that ‘BTR’ APCs of 82nd modification as cadre armament of the 18th motorized rifle brigade in Donbas were registered by us in July 2015 which was described in our publication “Putin’s Eleven” -Selfie Soldiers of 18th Russian Motorized Rifle Brigade in Donbas. The fact that Russian forces used “BTR-82” in the east of Ukraine has been confirmed several times including even the Russian sources. Moreover, there is a photo evidence of a destroyed armored personnel carrier in Novosvetlovsky, Luhansk Oblast. Ruslan Sultanov – originally comes from Dyurtyuli (Republic of Bashkirya). Presently, he has been transferred from the 18th motorized rifle brigade to 201st military base in Tajikistan. Social profiles – “VK” and another one (archives of profile and profile2, album and album2, contacts and contacts2). 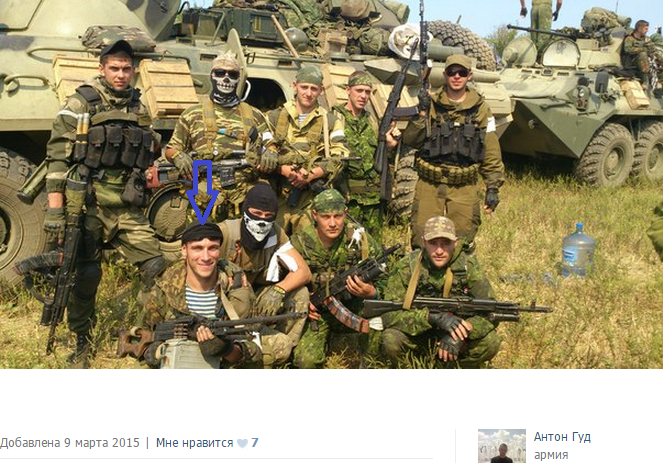 It is worthy to highlight one of Donbas photos taken in August, 2014, where he wears a camouflage and hides face beyond a keffiyeh and has a Saint George’s ribbon which we have seen on other Russian criminals from 18th Motorized Rifle Brigade in Donbas. 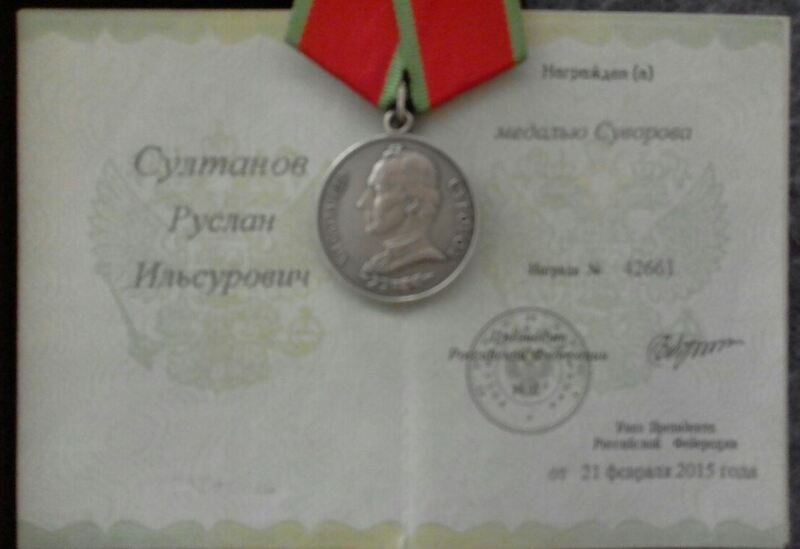 With a little delay he was awarded “Medal of Suvorov” No.42661 (by the Decree of President Putin from February 21, 2015). This InformNapalm‘s article is not only of information nature. The gathered data goes to the database with facts of the Russian army’s participation in the war in Donbas, please reference to Professional Russian Army in Ukraine. Database and Visualisation. A note for organizations and analytical centers: using our materials please cooperate with the primary source rather than simply copy the information without reference to the original article. Original article was prepared for publication by Irakli Komakhidze specially for InformNapalm. (CC BY) Information specially prepared for InformNapalm.orgsite, an active link to the authors and our project is obligatory for any reprint or further use of the material.